Maintaining a business entity’s “good standing” status with the Office of the Secretary of State prevents fines, penalties, filing delays and the additional compliance costs required to reinstate the entity. There are also numerous other reasons for keeping business entities in good standing. And forget even trying to sell a business that is not in good standing! Keep in mind that loss of good standing will eventually lead to revocation. Revocation can result in the loss of the limited liability protection of business entities, thus exposing entity’s owners to personal liability for the debts incurred by the entity. Revocation can also lead to a loss of an entity’s legal right to use its name and to the inability to enforce contracts in courts. Keep a calendar of upcoming compliance filing events such as annual report and tax due dates for the various states in which the business is active. (Note that many states do not send notices regarding upcoming or past due reports.) Keep in mind that state agencies that collect taxes other than the Secretary of State may report noncompliance to the state, which can affect good standing status. Compile a list of requirements and fees for the various reports that need to be filed, so as to avoid missing deadlines and to prevent unnecessary document delays or rejections. Business licensing may be required for an entity and failure to obtain/renew those licenses can, in some states, affect your status with the Secretary of State. Keep a calendar of license renewals and requirements and be well prepared. Perform a periodic status check in each state. This will help identify any issues before they turn into larger problems. Update the principal office and mailing addresses with the Secretary of State by submitting updates as changes occur or as required (on the annual report, for example). This will ensure the timely receipt of any notices and warnings. 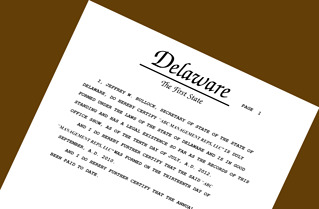 Update the states’ records as soon as possible with any changes in the company’s name or structure (e.g., re-domestications or conversions), so that all states properly reflect the name and entity type of the domestic state. Valuable and affordable resources and tools are available to assist you in keeping your business entities compliant with state requirements. Any number of professional registered agent service companies can provide annual status checks. Many also offer entity management systems to help manage compliance due dates along with providing forms and other assistance for all of your Secretary of State and business licensing needs. Follow these simple tips and, with the help of some great resources and tools, avoid the unnecessary expenses and problems associated with losing good standing!